This latest work from Motor Marc titled Shoreline Hidden Treasures is a motorcycle painting that tells a story and combines elements of custom bikes with a tropical theme. The joy of found treasure has everyone smiling and staring in awe. Motor Marc’s unique style and attention to detail comes alive in this nautical tribute to the custom bike. The vibrant colors swimming in the sea, sparkling treasure and the afternoon sun are reflected in the bike’s chrome and the piece has a light airy feel to it. 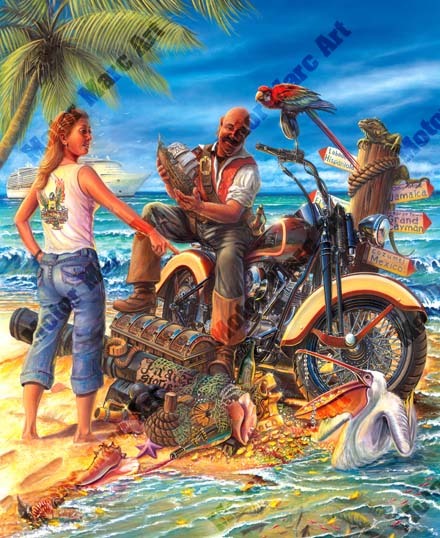 As the officially artist for the Hogs on the High Seas Cruise Motor Marc has created this piece specifically for the 2007 Caribbean cruise and is pleased to offer his exclusive artist proofs diamond deluxe limited prints. Act now as this edition is sure to go quickly. Third painting produced for the “Hogs on The High Seas” cruise on Royal Caribbean Cruise Lines. “Shoreline Hidden Treasures” is a new release for the 2007 cruise. Ask to reserve your print. Low limited numbers in the collection. Visit High Seas Rally Website for details on the cruise.